I know there are lot of hexie lovers out there. Jessica Jones from How About Orange (and I also know there are a lot How About Orange readers out there too...) posted the link to this freebie the other day, a hexie notecard! I love this card! Perfect for all the hexie lovers out there. Thanks for the link - I am definitely going to print some of these. I love that blog and the card is adorable! 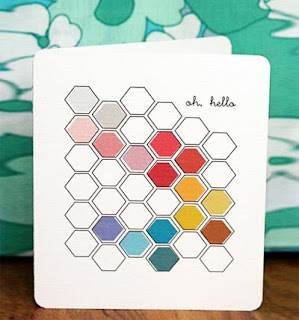 so going to print out that card...I've fallen for hexies just like everyone else!